The purpose of gait analysis is to find out whether your feet are having an adverse effect on your body as you walk and run. It isn’t just about flat feet – it’s about a host of other largely invisible issues, which can cause problems throughout the legs, hips and spine. You may have had your gait checked in a running shop when you bought your trainers and been told that you “over-pronate”. The staff will then have recommended that you buy shoes which help compensate for this. With any luck this will have relieved your problem, but there is a lot of luck involved: first, the shop assistants will only be able to judge very roughly the degree to which your feet are pronating. And they won’t be able to see any problems further forward than the heel. And in any case, they have only 3 shoe options to cater for all the possible foot types. To do the job properly requires a specialist. Not only can we at the Ashgrove Clinic Analysis provide the specialist gait analysis, we can also prescribe the highest quality orthotics (insoles), tailored individually to your feet to cater for a whole range of problems. Our specialist will conduct a number of orthopaedic tests, examine the joints of each foot, observe your walking/running style and use a high tech computer system to assess pressure development as you walk across a force plate. The advantage of our system is that we get a very clear picture of how your feet function as you are actually walking. 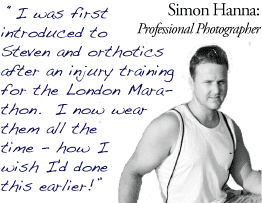 We are very confident that our orthotics are among the best in the world. But we would say that, wouldn’t we? Well, in order to reassure you that we put your concerns first, we will refund the cost of the orthotics if there is no noticeable improvement in your symptoms after 6 months. Nobody else makes this commitment – we do it because we understand that you need to have confidence that we put your wellbeing above all else: we are not simply salesmen. Gait Analysis is not just for sportsmen! The average person takes between 8,000 and 10,000 steps per day. Uncorrected gait problems are a form of Repetitive Stress Injury – over a period of time, small problems in the foot can lead to larger, more deep seated pains elsewhere. For example, a common cause of problems is over-pronation. Put simply, this means that you foot may be rolling inwards excessively as it strikes the ground. As it does this, the whole leg twists inwards. A small amount of pronation is normal and necessary, but too much can put a strain on the knee and hip, and may cause tension in the muscles as they try to compensate. Uncorrected gait problems can mean that other treatment for aches and pains only has temporary effect – if the underlying cause is poor gait, the problem may well recur. If you’re suffering from any of the problems listed in the box, or other problems which seem to be aggravated by walking or running, you may well be a candidate for gait analysis.